Let’s start with tomorrow’s issue of Nature, which besides the two new studies (one of which I was involved in) also includes a News&Views commentary. Everything revolves around the question of whether the Gulf Stream System has already weakened. Climate models predict this will be one consequence of global warming – alongside other problems such as rising sea levels and increasing heat waves, droughts and extreme precipitation. But is such a slowdown already underway today? This question is easier asked than answered. The Atlantic Meridional Overturning Circulation (AMOC, also known as Gulf Stream System) is a huge, three-dimensional flow system throughout the Atlantic, which fluctuates on different time scales. It is therefore by no means enough to put a current meter in the water at one or two points. What changes in the AMOC do the data show? The time series from the two new and some earlier studies are shown in Fig. 2. Each of the six curves is based on a different data type and methodology, but they show a largely consistent picture. The green curve shows changes in water mass based on deep sea coral data, the blue curve shows the grain sizes mentioned and the yellow curve shows the RAPID measurements discussed above. The three remaining curves are based on temperature changes – but also on three different methods. The curve from Rahmstorf et al. 2015 was based on a network of land-based proxy data such as tree rings and ice cores, while the new red curve from Thornalley et al. was based on sediment data. And the new curve from our study (dark blue) uses measured sea surface temperatures, as shown in Fig. 1. Fig. 2 Time evolution of the Atlantic overturning circulation reconstructed from different data types since 1700. The scales on the left and right indicate the units of the different data types. The blue curve was shifted to the right by 12 years since Thornalley found the best correlation with temperature with this lag. Makes sense: it takes a while until a change in currents alters the temperatures. Graph: Levke Caesar. The curves all show a long-term slowdown that is accelerating. The red curve is so smooth because these particular sediment data have too low a time resolution to show shorter fluctuations. The blue curve shows an early decrease already in the 19th century, which Thornalley and colleagues attribute to an earlier warming at the end of the so-called ‘Little Ice Age’, when the inflow of meltwater could have slowed the formation of deep water in the Labrador Sea. This is not necessarily a contradiction to the other data series, because the two sediment cores used are located in the area of the deep outflow of Labrador Sea Water – but this is only one of two deep currents that together make up the southward part of the overturning circulation of the Atlantic, and thus the heat transport to the north. Therefore, the time evolution of ocean temperatures does not always have to coincide with that of the Labrador Sea Water. In our study we conclude that the AMOC has weakened by about 15% since the middle of the 20th century. In absolute figures, this is a weakening of the current by 3 million cubic metres per second – a figure that corresponds to around fifteen times the flow of the Amazon, and thus three times the outflow of all rivers on earth combined. Using a whole suite of climate models (the CMIP5 models), we have tested how well our temperature-based estimate can reflect the actual trend of the AMOC, and have arrived at an uncertainty of plus or minus one million cubic metres per second. There are a number of other studies worth reporting on the subject, which I can only briefly mention here. Moore et al 2015 found in Nature Climate Change that convection (the deep mixing of seawater closely linked to the AMOC) in the Greenland and Iceland Seas has weakened and is likely to exceed a critical point as global warming continues, where it will become limited in the depth reached. Sevellec et al 2017 argue in the same journal that the weakening of the circulation could be caused mainly by the shrinkage of sea ice in the Arctic. Oltmanns et al (2018, again in Nature Climate Change) recently found signs of a growing risk that convection in the Irminger Sea could shut down. Sgubin et al. (2017, Nature Communications) analyse the occurrence of abrupt cooling in the North Atlantic in various climate models. And finally, Smeed et al. 2018 recently reported in Geophysical Research Letters on the latest measurements in the RAPID project, which are also included as a linear trend in Fig. 2. At the annual gathering of the European Geosciences Union (14,000 geoscientists are meeting in Vienna), which I am currently attending, the changes in the North Atlantic are also an intensively discussed topic. What effects could the slowdown have? It sounds paradoxical when one thinks of the shock-freeze scenario of the Hollywood film The Day After Tomorrow: a study by Duchez et al. (2016) shows that cold in the North Atlantic correlates with summer heat in Europe. This is due to the fact that the heat transport in the Atlantic has not yet decreased strongly enough to cause cooling also over the adjacent land areas – but the cold of the sea surface is sufficient to influence the air pressure distribution. It does that in such a way that an influx of warm air from the south into Europe is encouraged. In summer 2015, the subpolar Atlantic was colder than ever since records began in the 19th century – associated with a heat wave in Europe. Haarsma et al (2015) argue on the basis of model calculations that the weakening of the AMOC will be the main cause of changes in the summer circulation of the atmosphere over Europe in the future. Jackson et al (2015) found that the slowdown could lead to increased storm activity in Central Europe. And a number of studies suggest that if the AMOC weakens, sea levels on the US coast will rise more sharply (e.g. Yin et al. 2009). The impacts are currently being further researched, but a further AMOC slowdown cannot be considered good news. Yet, although the oscillations seen in Fig. 2 suggest the AMOC may well swing up again for a while, a long-term further weakening is what we have to expect if we let global warming continue for much longer. Several articles by so-called “climate skeptics” (e.g. James Delingpole on Breitbart) have dismissed our findings by pointing to previous studies that supposedly contradict these. This is based on apples-to-oranges comparisons, in that these studies consider different aspects of the ocean circulation and most importantly look at short time periods dominated by natural variability. For 1994-2013, Rossby et al. (2013) found a decrease in the upper 2000m transport of the Gulf Stream by -0.8 Sv. Also for 1994-2013, Roessler et al. (2015) found an increase of 1.6 Sv in the transport of the North Atlantic Current. For this period, our reconstruction yields an AMOC increase by 1.3 Sv. There is thus no contradiction there, and anyone who has looked at the time series in Fig. 6 of our paper or Fig. 2 above should have seen this right away. These articles illustrate once again how “climate sceptics” are not interested in an understanding of science, but in confusing the public with misleading claims. Washington Post: The oceans’ circulation hasn’t been this sluggish in 1,000 years. That’s bad news. Thanks for your work – and also your blogentry here. Very much appreciated. The studies are particular interesting – unfortunately if I may say so. Two questions puzzle me after reading them in Nature. Hope you can elaborate. 1.Given the estimations that the AMOC has weakened about 15% since the middle of the 20th century. Can we expect similar decline next 50 yrs from now? 2. if understood correct by me both studies emphasize most important questions remain as to when exactly the decline commenced. Why is the question not the status of AMOC in 50 or 100 yrs from on the basis of the median IPCC-scenarios? Have any studies appeared on coupling of AMOC variation and that of polar sea albedo from E. hux , Nitzschia and other plankton blooms ? It would be interesting to see the other side of this globe to see Australia and New Zealand as the Southern hemisphere appears here to be having warmer water. Anecdotally, New Zealand has seen more jellyfish migrating down in the last few years and unusually warm seawater (swimming starts earlier than 5 years ago even) and people who’ve lived here since the 1950s say that today’s cyclones were unheard of back then. AB: The weakening appears to be accelerating. Add in the risk of serious freshwater influx from Greenland (which, IIRC, would/(is?) shove surface currents towards Europe, thus warming the continent while diminishing the AMOC) and a similar decline in the future sounds optimistic to me. That’s seems like a rather weak warning. It’s also passive as if we are just letting the globe warm when an argument might be made that our species is actively stoking the fires every day. I love your work, but maybe things would work better with less passive framing? Someday, we may look back and say, oh, maybe mistakes were made with the kind of messaging that was in vogue back in those early hectic days of the anthropocene and the sixth great extinction? Could our conclusions have been more definitive? better structured to hasten changes to reduce the warming? may you encounter warm regards that occasionally stream forth from my IP address and meander across the lovely planet in your direction. The Sevellec et al. 2017 reference points to Moore et al. 2015 Decreasing intensity of open-ocean convection in the Greenland and Iceland seas. Very clear explanation thanks. It was reported on the BBC radio this morning but simply as an interesting scientific curiosity with no climate context. Hopefully some of the press and social media will inform the public better. 4 Susan Kraemer. Does this help? Thanks, will fix the link – was preparing this post in a hurry yesterday while at the EGU conference. The recent spate of storms and severe winter weather in Europe have been suggested as linked to changes in the Jet Stream. Has there been any suggestion of association between the diminishing AMOC and changed patterns in the Jet Stream? It’s no secret that models–not just of climate, but *all* complex numerical models!–are going to have shortcomings. If properly characterized–they are nevertheless ‘useful’, in George Box’s famous phrase. Dan, I bet you aren’t even aware of how your mental ‘filtration’ focuses your attention. Fascinating and very well-explained — thanks! I wish people would stop conflating AMOC and the Gulf Stream, which I find to be obfuscating. AMOC is slow and thermodynamically driven by density gradients. The Gulf Stream is fast and wind-driven, a classic example of a subtropical gyre. Both contribute to poleward energy transport and therefore Western Europe’s relatively warm climate, but they are very different and conflating them contributes to public misunderstanding of the climate system. Thanks for the post. Yet, I can’t see in the HadISST observations the SST dipole simulated in your model as a response to a shift of the Gulf Stream. Could it suggest that your model overestimates the AMOC weakening and/or the SST footprint of this weakening? More importantly, Amy Clement (Science 2015) suggests that it might be misleading to interpret the North Atlantic low frequency SST variability mainly as a response to ocean dynamics. Could you comment this point? Finally, moving to the atmospheric response to the AMOC slowdown, you might want to be more careful and also quote other studies (including analyses of decadal hindcast experiments) that do not find a strong or robust atmospheric response to the AMO SST pattern. Seems like a reasonable summary. As the current slows, the ocean’s absorption of CO2 slows. After all, you can’t have cold upwellings if nothing is sinking. Or O2 in the depths. Or nutrients at the surface (except where human discharges have created dead zones, of course). X% slowing brings a first uneducated guess of an X% eventual reduction in productivity for all these functions. Anaerobic stuff will gain biomass/advantage in the depths and stuff that can survive in hot nutrient-poor bathwater will thrive at the surface. Maybe dr causation will come up with a way to pump all that dead zone pollution out to sea so as to fertilize the rest of the oceans… Yeah, that’s the ticket. Let’s hose the oceans! Let Stefan express it how he wants. Exaggeration demands more and more exaggeration for the same effect. Do really think no one notices? Al Gore’s warnings look pretty silly now, although financially he is doing wonderfully. So it maybe depends on your priorities. For some people, the truth as they see it is a priority. great article on a topic that has received a lot of attention. In the discussion on the FT.com, someone brought up Rossby et. al, 2013 (https://agupubs.onlinelibrary.wiley.com/doi/full/10.1002/2013GL058636), which found no evidence of a trend in MOC based on 20 years of measurements. Do you have any thoughts on the methodology they used and differences between their results and those arrived at by the RAPID team? My inexpert conclusion from review of the Rossby study versus the RAPID study is that RAPID’s measurement may be more robust, but I was disappointed that RAPID does not discuss Rossby et. al., which seems relevant to their study published in 2018 (https://agupubs.onlinelibrary.wiley.com/doi/full/10.1002/2017GL076350) in the same journal. Anyway, would be curious to get the thoughts of those more knowledgeable. I’m curious what this means for the Atlantic Multidecadal Oscillation. Has the weakening of the AMOC also weakened the AMO? ‘oogled: AMOC and changed patterns in the Jet Stream? May 28, 2015 – The AMOC current. Credit: Nature 2012. The jet stream off the East Coast of the United States controls an important climate pattern in the Atlantic … “The North Atlantic Oscillation is really driving these changes in ocean circulation,” said Gerald McCarthy, lead study author and an oceanographer at the University of Southampton in the United Kingdom…. 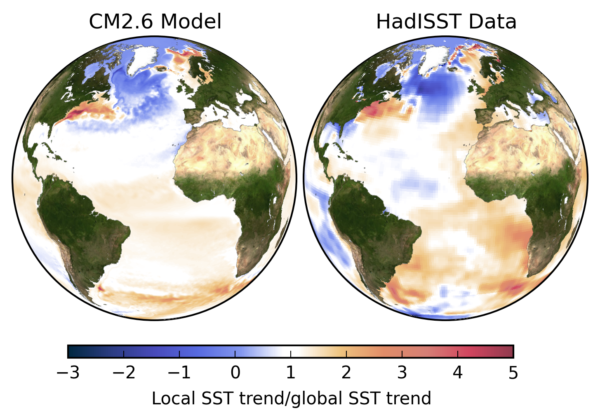 In the past 90 years, the Atlantic Multidecadal Oscillation has undergone three major transitions: warming in the 1930s and mid-1990s and cooling in the 1960s. Those shifts can be attributed to the North Atlantic Oscillation, which switched phases just before the AMO did, the study reported. Depending on where the powerful winds cross the Atlantic, the jet stream can have a cooling or warming effect on sea surface temperatures in the North Atlantic Ocean, according to the study, published (May 27 2015) in the journal Nature. Is less poleward transport of heat by the Gulf Stream as the AMOC weakens a positive feedback for global warming, since that energy will escape more slowly in the humid(higher water vapor GHG effect) tropics than near the poles? Al Gore is a politician, not a scientist. So your credibility is pretty much shot if you use him as a reference. I think we need a new category of fallacy: “But Al Gore is Fat” fallacy. This is really a compound of two fallacies–the ad hominem and the non sequitur. There are also aspects of the argument from authority fallacy–but instead of arguing that a false authority/non-expert’s testimony supports a position, you argue that such an argument not being borne out undermines the positions of the true experts. One would have to be pretty stupid to fall for a fallacy like this, but how much stupider would one have to be to think it had any validity? Thank you for the write up. Do you have any thoughts on the implications for the Nordic Seas? Can you elaborate on the complex warming signal in the Nordic Seas and Barents Sea in relation to the AMOC slowdown? Al Gore is noteworthy because he has some sway with a large number of people (unfortunately in my opinion). He is a person just like scientists so using him as a reference works. Sometimes it pays to look at the argument rather that credential. Mike #7: Thanks for the continuing high-quality input. In this case your sense of urgency is laudable, but think of all those in the past who have stepped outside their areas of expertise, have made policy recommendations, and have embarrassed themselves; of the climate deniers who have let their personal beliefs (philosophical, political and/or religious) shape their science and who now have no credibility and can only find employment at or through corporations with vested interests and/or rich ideologues with think-tanks and endowments. If the scientists stick to science, and the politicians stick to politics and call upon scientists to give evidence and inform policy decisions, they’ll all be better off. BTW, this AMOC discussion is quite fascinating. We’re seeing highly uneven global warming, ocean currents spreading the warmth in counter-intuitive ways, and unlikely climate feedbacks. Complexity abounds. The non-scientist observer sits on the edge of his/her seat. A paper put out by James Hansen’s group describes how global warming in the past may have engendered super-storms. If the AMOC stalls and warm pools proliferate in the tropics, it’s easy to imagine that occurring. My point exactly, thanks. (However, we may disagree on how large the shortcomings.) Did you know that Dr. Mann has said that models indicate that increased warming must come from the increase in CO2 because the models show no other mechanism? That is a foundation for the consensus that increased warming is 100% man caused as far as I can tell. By the way, I do use ‘filtration’ to focus my attention. Other times I make attempts to keep my mind open. Thanks for the input. The subtropical gyre itself is in mass balance since the flow up the North American continent is balanced by the flow down the European/African side, with that flow being much broader than the Gulf Stream itself. Thus it appears that disruption of deep water formation in the North Atlantic, via a blob of colder fresher water coming off of Greenland, would not ‘shut down’ or even affect the Gulf Stream net mass transport at all, but instead would shift its northern return flow southwards, with many severe regional consequences. However, at the same time, there’s been the steady increase in subtropical ocean surface temperatures in the Atlantic Warm Pool, leading to record water temperatures off the US east coast in winter, which tends to fuel more extreme storms (via the increase in water vapor pressure over the warmer ocean). This seems to indicate that extreme weather events are going to be more likely along the US east coast than in the past, particularly when you add in these cold Arctic breakouts which appear related to a meandering jet stream. Eventually this could be overridden by more extreme warming but by then we’re talking about the complete loss of the Greenland ice cap, which is at least several centuries away. P.S. Future forecasts seem very sensitive to the rate of meltwater production from the Greenland ice sheet. Given that atmospheric CO2 continues to rise at record rates and fossil fuel use is not going down, and considering lag times in the system, then we can be sure that 20 years from now the Greenland melt rate will be significantly higher than it is today. Realistically, this means planning to deal with inevitable climate trajectories is just as important as transitioning to renewable energy and phasing out fossil fuels. The tipping point was passed some time ago, that’s a safe bet. DDS 30: models indicate that increased warming must come from the increase in CO2 because the models show no other mechanism? That is a foundation for the consensus that increased warming is 100% man caused as far as I can tell. BPL: I take it you never in your life took a course in climate science, atmosphere physics, or planetary astronomy. Could you please provide an internet link to this? It doesnt sound like something he would say, and googling your statement did not bring anything up. I got reasoning directly from a Dr. Michael Mann youtube video. Happily, we both agree because his argument did impress me either. It is not just that the models do not show an alternative cause, it is that there isn’t even an inkling of what such a cause could be. The models also are stumped for any mechanism by which you could dump as much carbon as we have dumped into the atmosphere and NOT have it warm. And do not forget that warming of the troposphere is only part of the issue. You also have to explain cooling of the stratosphere. Your beef seems to be not with the models per se, but with basic physics. Here in coastal Virginia there is evidence of the Gulf Stream slowdown. The Gulf Stream pulls water away from the coast, and more so the faster it moves. In recent years there has been a lot more flooding, especially in Norfolk. The amount of flooding is a crude measure of the slowdown, and it illustrates the major harm the slowdown can cause. If trends continue, Norfolk will be mostly underwater within a century or so. The Navy, which has a huge presence in Norfolk, is reportedly very concerned. It seems to me that Dan DaSilva is desperate to find some excuse to ignore what the world’s climate scientists are saying about the climate. Good luck with that. I have no beef with basic physics and it was my favorite course as an engineering major in college many years ago. It can be verified to an extremely high degree of accuracy. Understanding the earth’s climate enough to accurately model it is not yet possible and goes beyond basic verifiable physics. 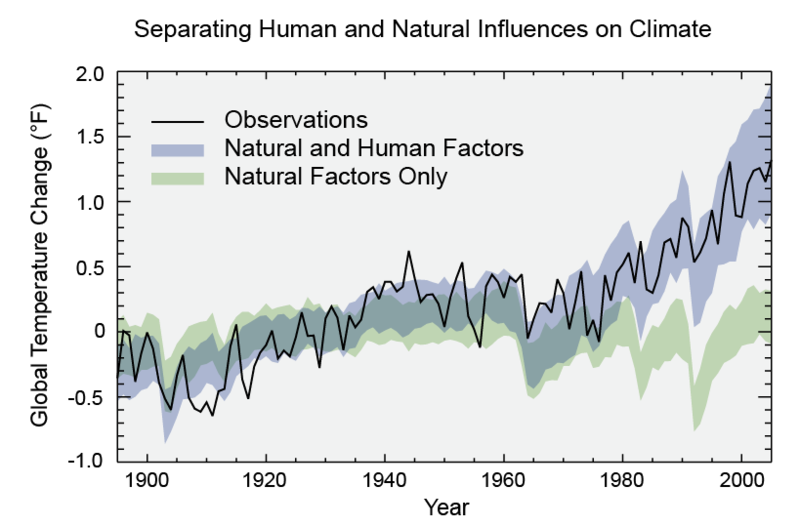 Models can “predict” past climate were well, do you think that is a validation of the models? I do not, it is curve fitting. Models tend to show precision where it does not exist. I do not reject global warming but I am skeptical of too much precision and too little humility. So is a person who understands and likes basic physics but not advanced climate science justified in being wary of accepting claims by a scientist? See link in comment 35. If I have mischaracterized Dr. Mann please indicate. Let’s back this up a bit: Models are filled with real world data, Dan. They do not exist in a vacuum. Their efficacy is based upon being able to, to varying degrees depending on the model and its purpose, recreate past climate. Only when they do this to the degree needed do scientists then use them to run potential future scenarios. There is nothing “wrong” with the models; they are always growing and improving, but are not in any sense broken, nor are they the “doing” of science in the sense so many deniers try to falsely claim, but the result of having done science and using that data to make educated guesses about the future. So, since the science can find no alternate hypothesis that fits the data, neither do models. Again, this is not a failure of models, nor are models used to search out new theories, per se, since they are reflections of the physical science, not precursors to it. Complete utter horsecrap. Clearly you don’t understand the first thing about modeling–to wit, that there are different kinds of models. Curve fitting is an issue for statistical models. However, climate models are physical models. You aren’t looking to “fit curves,” you are looking to reproduce trends. You are looking for “insights”, not “the answer”. Climate models provide insights and falsifiable predictions in abundance. They have an excellent track record of verified predictions. Look, Dan, you are arguing from extreme ignorance. All you are accomplishing is making yourself look like a moron. Wrong. Dr. Mann in the initial few seconds of your link did NOT say “models indicate that increased warming must come from the increase in CO2 because the models show no other mechanism”. He said that it was discovered in the 90s that one must include man-released carbon together with current inputs and mechanisms into any model which was going to predict well. That is an entirely different thing from what you are asserting. As others here have said, models do not predict mechanisms and inputs. They take mechanisms and inputs and show how the scenario develops given those mechanisms and inputs on into the future (or past if hindcasting). At all other points Dr. Mann completely focuses on observations. So yes, you mischaractize Dr. Mann. The Guardian says: “the Atlantic Meridional Overturning Circulation (Amoc), has weakened by 15% since 1950, thanks to melting Greenland ice and ocean warming making sea water less dense and more buoyant. scientists (including Stefan) are saying we must avoid a serious disruption of the AMOC at all costs. I think by any reasonable measure, we have already incurred a serious disruption of AMOC. 15% weakening? Is that not a serious disruptcion? Maybe serious disruption is defined as 25% slowdown? where did all the animals go? is the barn door open? and see the ensuing and linked discussion. Be wary of the “God is in the gaps in the fossil record” form of argument. It hasn’t worked well for the anti-evolution folks to claim that there has to be a mysterious hidden force operating in between and around everything that science has discovered. Same problem for climate. That’s from the wealth of information recently removed from the EPA’s website by whatsisname. Give me variables totally unrelated to climate and even I can recreate past climate temperature record (or a lot of other past records). I not sure what creating past climate means. f(y) = The population of germs in my kitchen sink. f(z) = The pregnancy rate of women over 40 in France. So why is the ability to “recreate past climate” mean anything? Does recreate past climate mean that they can recreate the past year average temperature and rainfall for every city in the US without being tuned to do so? If so that would seem impressive. I very well could be missing something, so please tell me what. If this is true, where does the mass of colder, saltier, sinking water that drives the AMOC originate? It would appear that you mean that you can derive a function that characterizes, ex post facto, some climate parameter, and mathematically morph it to something unrelated. That’s curve fitting, and John Von Neuman had some things to say about that. Numerical models don’t do that, as has been said above; rather, they simulate the physical processes involved. So, what ‘creating past climate’ means in this sense is that we have good evidence that the we understand in reasonable detail how the inputs considered produce the outcomes observed. What Dr. Mann evidently said is that no such modeling exercise has identified a scenario in which the anthropogenic inputs we know existed (and continue to exist) can be dispensed with in modeling the observed outcomes. You’ll notice, Dan, that that is the exact inverse of what you claim–you say that your methods are successful without any constraint. Climate modeling, not so. Does recreate past climate mean that they can recreate the past year average temperature and rainfall for every city in the US without being tuned to do so? No. That isn’t climate, it’s weather. By contrast, climate simulation tries essentially to get the bulk statistics right. So it can address questions like “Given inputs a… n, what will be the the trajectory of mean global surface temperature over the decades til 2100?” Since the models are structured on various grid schemes, it’s natural to consider the spatial aspect, too. Thus, modeling exercises have for decades now shown some pretty persistent patterns of recurrence, such as drying trends under warming in certain areas (notably the Mediterranean basin, including the Middle East) and the American Southwest–patterns we see in the real world. Dan, I can’t help but wonder: how is it that I–a musician by training, and undoubtedly someone whose mathematical background is far weaker than yours–knows this, but you don’t?